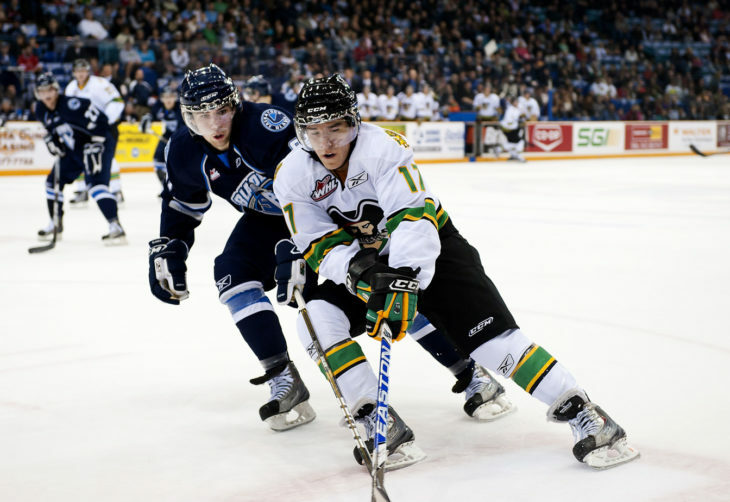 In our first of four 2019 WHL Playoffs second round previews, we examine the Prince Albert Raiders and Saskatoon Blades. Hockey fans in northern Saskatchewan are in for a treat as the Prince Albert Raiders and Saskatoon Blades collide in the second round of the 2019 WHL Playoffs. In their respective bids to change the script on their team’s playoff success, they’ve been among the league’s best this season. Now, they’ll battle for a spot in the Eastern Conference Championship. 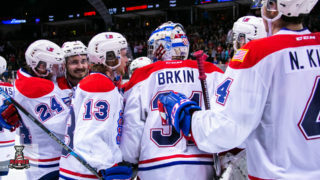 The Raiders enjoyed a legendary season where they went 54-10-2-2, staying among the Canadian Hockey League’s best from early October through to the end of the season. With a balanced roster at all three positions, the Raiders swept past the Red Deer Rebels in four games. San Jose Sharks prospect Noah Gregor and teammate Dante Hannoun each recorded a pair of goals and five points in the four-game series versus Red Deer. Toronto Maple Leafs prospect Ian Scott posted all four victories for the Raiders while maintaining a 1.75 goals-against-average and a .915 save percentage. On the Blades’ side, they’ve enjoyed their fair share of success as well. Ending a five-year playoff drought, the Blades didn’t waste any time in making a good impression with a sweep of the Moose Jaw Warriors, highlighted by an overtime finish in Game 4. Max Gerlach scored five of Saskatoon’s 13 goals in the first round, ranking among the top performances of advancing teams. 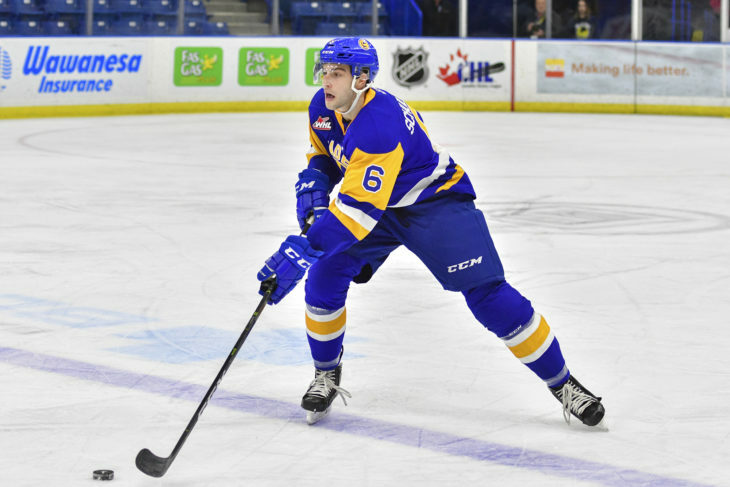 2019 NHL Draft prospect Kirby Dach impressed with a highlight-reel goal late in Game Four to finish with three goals and five points in the series. Goaltender Nolan Maier was sharp between the pipes with a 1.94 GAA and a .916 save percentage in the four games. The draft-eligible goaltender stopped 87 of 95 shots in the series, winning three of the games by a single goal. In the season series, the Raiders won all four games at the Art Hauser Centre, making the building a formidable part of the opposition to the Blades The Blades did win a pair of games on home ice and hold the distinction as being the only team to shutout the Raiders all season thanks to a 32-save performance from Nolan Maier on December 9, 2018. The first three games of the best-of-seven series will be broadcast nationally on Sportsnet with Game 1 at the Art Hauser Centre Friday, April 5 (7:00 p.m. MT). Game 3 will see the series shift to the SaskTel Centre on Tuesday, April 9 (7:00 p.m. MT). 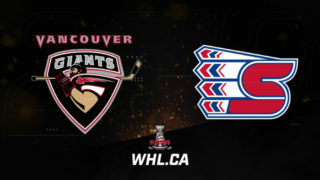 Catch the #WHLPlayoffs on @Sportsnet! First three games of #PAvsSAS to air nationally on Canada's home of hockey! Get your calendars out! 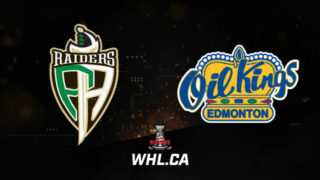 @PARaidersHockey & @BladesHockey set to tango in second round of 2019 #WHLPlayoffs! Home cooking is the best: As the adage goes, you’re never in trouble in the playoffs until you lose at home. 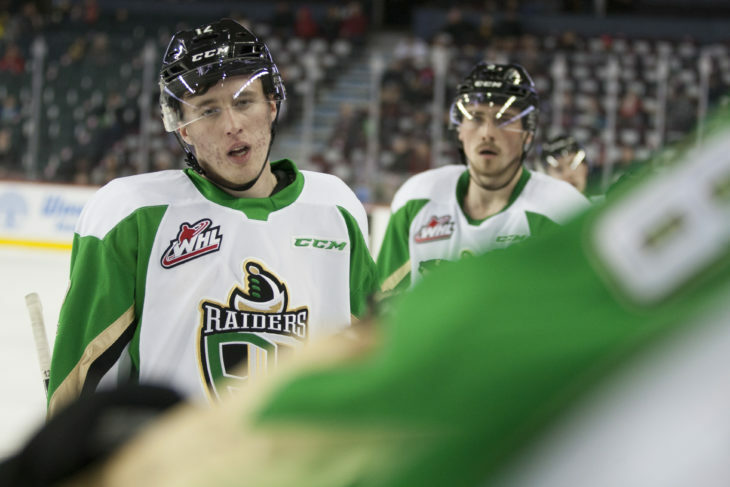 For the Prince Albert Raiders, they took care of business both times during the first round against the Red Deer Rebels and led the league with 28 home wins during the regular season. Four of those came at the expense of the Saskatoon Blades, who they outscored by a 16-6 margin at the Art Hauser Centre. They scored a league-high 157 goals on home ice during the regular season and potted nine over their first two home playoff games. It goes without saying that the Raiders would clearly prefer not to have things extend to that fourth home game of the coming series, but they know they’re in good hands when the Raider faithful welcome onto the ice at their home rink. It also goes without saying that the path to victory can become easier if they roll down to Saskatoon with a 2-0 lead in hand. Keep building momentum: For the Saskatoon Blades and their fans, their first taste of playoff action has left them rightly wanting more. The Blades may have endured a tough result in the regular season series, but given how they finished the regular season and went through the first round, they have every right to have a high level of confidence going into the second round. That’s not to say they should get too high though. Three of the eight games were settled by a single goal and two more were settled by a pair of goals. Ultimately, the Blades went 2-2-1-0 in those five games giving the indication this should be a tight series. If there’s a team that can four of the next seven games against the league-leading Raiders, it’s the Blades. They’ll need to do something they haven’t done since March 17, 2018, win at the Art Hauser Centre, in order to do that though. But hey, it’s the WHL Playoffs and crazier things have happened. Noah Gregor (43-45–85): Much of the discussion around the Raiders being able to assemble such a talented roster revolved around the acquiring of Brett Leason for a third-round selection in the 2018 WHL Bantam Draft. However, one of the sneaky good acquisitions of the off-season came in the acquiring of Noah Gregor from the Victoria Royals in exchange for conditional compensation. 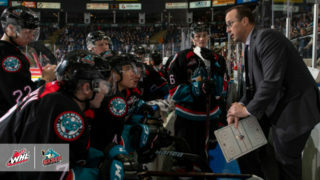 In fairness to Victoria, his status as an overage forward was in doubt with the San Jose Sharks taking an extra-long look at their fourth-round selection from the 2016 NHL Draft. Recording 85 points (43G-45A) to set career-high totals in goals and points while matching his career high in assists he’s been an all-world talent for the Raiders. Of his totals, 13 points (9G-4A) came against the Blades this season. In the first round of the WHL Playoffs, he recorded a pair of goals and five points to finish tied for the team lead. It’s safe to say that if Gregor can continue his strong play, the Raiders like their chances of moving on. Kirby Dach (25-48–73): The 2019 NHL Draft prospect tallied five points (3G-2A) to rank second on the Blades in their first-round sweep of the Moose Jaw Warriors. Dach’s third goal of the series came at a critical juncture on an amazing individual effort late in regulation. With an ensuing goal by Moose Jaw and OT winner by Kristian Roykas Marthinsen, it admittedly got a bit lost in the excitement of the game and series. However, that goal provided a perfect example of Dach being an x-factor on the ice for the Blades. Dach has risen to the occasion all season and is producing at nearly a point-per-game average through the first 133 games of his WHL career. He has yet to score against the Raiders in his career, posting eight assists in 16 career games against the team’s geographical rival, but all that seems to represent is another box to check off in terms of accomplishments for the 18-year-old forward. Also, after this writer picked Max Gerlach as the forward to watch in the first round, he went on to score five goals. Blades fans can certainly dream of a similar boost to an already productive Dach. Dazzling Dach! The @BladesHockey forward & 2019 #NHLDraft prospect features in this week's #CIBCShowdown! Sergei Sapego (10-33–43): Thousands of kilometres separate Vitebsk, Belarus and Prince Albert, Sask., but the two may as well be sister cities. Instead of a cultural exchange, there has been a hockey exchange, as the city in Eastern Europe has provided with two of the Raiders’ top offensive talents, including defenceman Sergei Sapego. Sapego proved part of his value to the Raiders and their playoff hopes with a pair of goals and three points in the team’s Game 2 victory against Red Deer. Fellow countryman Aliaksei Protas had a similar performance up front in the game. With four assists in seven games, Sapego found some offensive rhythm against the Blades and he’ll be looking to continue that trend in the second round. 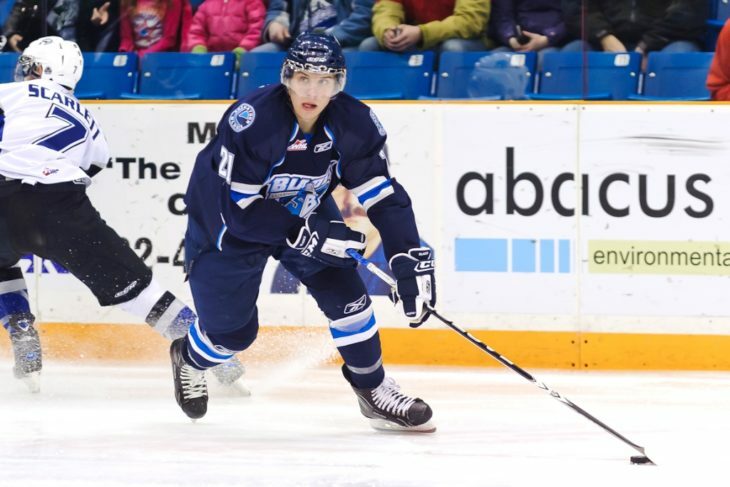 Brandon Schuldhaus (8-23–31): The Saskatoon Blades acquired the 6-foot-4, 205-pound Calgary, Alta. product from the Moose Jaw Warriors in early October 2018 as teams shuffled rosters to ensure they had the right group of overage talents. With 31 points (8G-23A) in 61 games, Schuldhaus was a key piece of the team’s blue line, a second left-shot option for the team to employ after Dawson Davidson. With so much talent at the top of the Blades and Raiders, this series could very well be decided by the player of the second and third line or pairing options on each team. Schuldhaus is one of those players that can provide a physical and offensive edge in the series as part of that difference. Ian Scott (49 GP, 38-8-1-2, 1.83, .932, 8 SO): Allowing seven goals in four games, Toronto Maple Leafs prospect Ian Scott continued to show why he was the WHL’s Eastern Conference Goaltender of the Year. His 1.75 goals-against-average, .915 save percentage and one shutout against the Rebels paved the way to a series win. While Scott was in net for both losses against the Blades, it’s worth pointing out in the same vein that he posted a 1.68 GAA and a .938 SV% in the season series. This are other world numbers for one of the WHL’s top goaltenders and if he can even get close to replicating those numbers, it’ll be a tough go for the Blades. 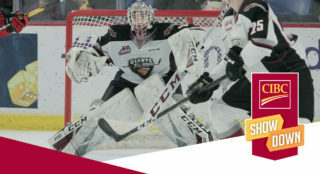 Nolan Maier (53 GP, 36-10-6-0, 2.64, .910, 4 SO): The Blades goaltender impressed in the first round of the WHL Playoffs with a 1.94 GAA and a .916 SV% to go along with his four victories. Maier’s performance in the first round, combined with how he finished the regular season earned him the WHL Vaughn Goaltender of the Month for March. One interesting tidbit heading into this series is the 32-save shutout Maier recorded against the Raiders on December 9, 2018. It was the lone shutout against the Raiders all season and serves as a confidence boost for Maier and a reminder to Raider fans that goals will come at a premium from the Yorkton, Sask. product. Nolan Maier of the @BladesHockey has been named the WHL @VaughnHockey Goaltender of the Month for March! The last time the Prince Albert Raiders advanced to the Eastern Conference Championship, they had a future NHL head coach on their roster. 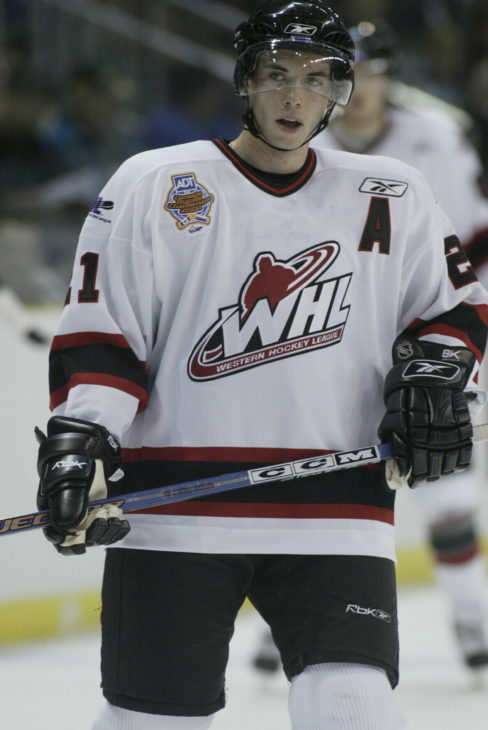 Jeremy Colliton, now running the bench of the Chicago Blackhawks, posted seven points (3G-4A) in 17 games as the Raiders swept the Saskatoon Blades in the first round and beat the Medicine Hat Tigers in six games before ultimately falling to the Brandon Wheat Kings in seven games. 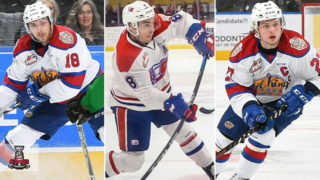 Aki Seitsonen and Kyle Chipchura were also on that roster at the time, showing how long the Raiders and their fans have been yearning for success in the WHL Playoffs. There’s a strong belief in this year being one where the Raider can go all the way and fans will get to cultivate more memories from the second round and beyond should they advance. In addition to the Blades not having made the WHL Playoffs since 2013, they haven’t qualified for the second round since 2011. In that year, Brayden Schenn and Curtis Hamilton each finished with 11 points while the likes of Darren Dietz, Duncan Siemens, and Stefan Elliott also graced the roster. To get the last time the Blades advanced to the Eastern Conference Championship, you’d have to go back to the 1994 WHL Playoffs when they lost in seven games to the Kamloops Blazers. This year is already a special one for the Blades and they definitely don’t want to end the party early. Is this the year they’ll push past the second round? Brayden Schenn of the Saskatoon Blades. Photo: Saskatoon Blades. The Saskatoon Blades and Prince Albert Raiders in action in 2010.